American Indians and Alaska Natives have the highest diabetes prevalence rates of all racial and ethnic groups in the United States. The Centers for Disease Control and Prevention (CDC) predict that one in two American Indian/Alaska Native children born in 2000 will have type 2 diabetes in their lifetime unless the current trend is halted. More than 16 percent have been diagnosed, compared to 8.7 percent of non-Hispanic whites. One in six American Indian and Alaska Native adults have been diagnosed with diabetes — more than double the prevalence rate for the general U.S. population. According to the CDC and Indian Health Service (IHS), in some American Indian and Alaska Native communities, the diabetes prevalence among adults is as high as 60 percent. The Pima Indians of Arizona have the highest rates of diabetes in the world, with more than half diagnosed with type 2 diabetes. 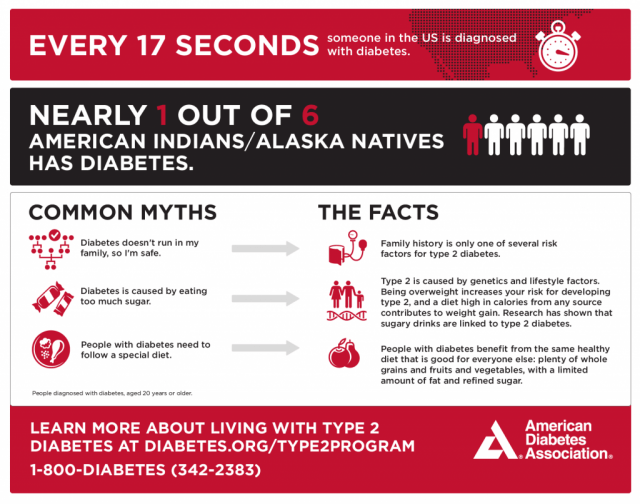 IHS data also shows that American Indians and Alaska Natives have a higher incidence of long-term complications from diabetes and that they develop it earlier in life. Kidney failure from diabetes among Native Americans and Alaska Natives was once the highest of any race. But it dropped by 54 percent between 1996 and 2013 after IHS began employing a comprehensive diabetes program, which included clinical care improvements as well as public health and population management approaches. Good diabetes care includes regular kidney testing and education about kidney disease and treatment. Kidney failure can be delayed or prevented by controlling blood pressure and blood sugar and by taking medicine that protect the kidneys.